LAKE FOREST, Ill. (AP) — This time, the Chicago Bears were good enough to overcome a tough day for Cody Parkey. That might not be the case very soon. 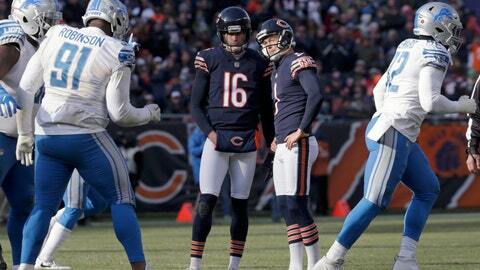 A day after Parkey missed two extra points and two field-goal attempts in a 34-22 victory over Detroit, coach Matt Nagy reiterated he has no plans to take a look at another kicker this week. But he acknowledged Parkey’s performance is only going to take on greater importance as the NFC North-leading Bears try to get back to the playoffs for the first time since after the 2010 season. The most remarkable part of Parkey’s trouble against Detroit might have been how he missed the four kicks, finding an upright each time. After Chicago scored on its first drive, Parkey kicked the extra point off the right upright. He hit the left upright on an extra point in the second quarter. On consecutive Chicago drives in the third quarter, Parkey rattled the right upright on a 41-yard field goal and again on a 34-yard attempt. “I don’t think I’ve hit the post four times in my whole life and I’ve been kicking probably for 15 years,” Parkey said right after Chicago’s third straight win. It got so bad that the crowd roared when the Bears went for a 2-point conversion after a touchdown later in the third. But Parkey’s teammates offered their support. Parkey connected on 21 of 23 field-goal attempts and 26 of 29 extra points last season with Miami, prompting Chicago to give him a four-year deal in free agency worth a little more than $15 million. It included a signing bonus of $2.25 million and a fully guaranteed base salary for the first two years, making it unlikely the Bears will cut him. The 26-year-old Parkey has missed five field goals in 18 attempts this season. The empty extra points were his first two in 32 tries. Nagy chalked up the performance to a bad day. One way might be some practice time at Soldier Field, one of the NFL’s toughest spots for kickers because of its proximity to Lake Michigan. Nagy said they are discussing the possibility. How quickly Parkey can recover from his difficulties against Detroit could be huge for Chicago (6-3), which hosts Minnesota on Sunday night. The Vikings have won four of five and are second in the division with a 5-3-1 record. The Bears and Lions play again on Thanksgiving in Detroit, and Chicago also hosts Green Bay and visits Minnesota before the season ends. Asked about balancing support for Parkey with any frustration with his performance, Nagy said he believes in being honest.